The "East Cape" sportfishing area of southern Baja California, Mexico, is solid gold water for the large or small boat angler who wants to catch really big fish. The relatively calm seas and very close proximity of glamour fish to shore here make East Cape a very special place where dreams can come true. This is where legends are made, and it is here that many "tin boat" anglers catch that "fish of a lifetime." Although its northernmost waters are usually accessed by sportfishing boats coming south out of La Paz, from a fishing point of view "East Cape" might be defined as the area between Canal de Cerralvo in the north, to the deep trench that touches the shore at Punta los Frailes in the south. This is the last section of "pure" Sea of Cortez, for south of Los Frailes, the fishing waters begin to show more properties of the open Pacific Ocean, such as surf and swell. visited by the area's multitude of charter cruisers, pangas, and private boats include: El Sargento, Bahia de la Ventana, Isla Cerralvo, Canal de Cerralvo, the "88 bank," Roca Montana, Punta Arena de la Ventana, Punta Perico, Ensenada de los Muertos, El Cardonal, Cerro Verde, Punta Pescadero, "The Pyramids" or "The Slide," Los Barriles, Buena Vista, La Ribera, Punta Arena, Punta Colorada, Cabo Pulmo, Los Frailes, Las Barracas, Las Destiladeras, and sometimes as far south as the Gordo Banks of San Jose del Cabo. When we fish our way southwards towards the Punta Arena lighthouse and talk about the East Cape's most southerly 15 miles, including the Cabo Pulmo coral reefs outside the marine park boundaires and Punta Los Frailes, we are covering probably the cream of the fishing of Mexico's Sea of Cortez. Middleweight game fish hug these East Cape inshore waters, while striped marlin, blue marlin, black marlin, sailfish, dorado and tuna prowl the deeper offshore waters. At this special sportfishing location, the deep blue waters meet the inshore waters only two to four miles out! Multitudes of big grouper and sea basses dwell in the labyrinth of caves and crevasses of the reefs. This stretch of the Sea of Cortez, starting at Punta los Frailes in the south and going north 15 miles to Punta Arena, has the finest combination of big game fish, small game fish, and diving in the Cortez--probably one of the best in the world. This is due to the area’s unique location and its underwater topography. The area close to Punta los Frailes and over the coral reefs of Cabo Pulmo is a national marine reserve. Within this bay are the only coral reefs along the western shore of North America. Fishing, spearing, or the removal of sea life is prohibited here. It is recommended that you check with local authorities for current rules, boundaries and enforcement. Although the famous Cabo San Lucas is traditionally thought of as the dividing line between the Pacific Ocean and the Sea of Cortez, for sportfishing purposes the Cortez really starts at the underwater canyon that reaches the beach along the south end of Punta Los Frailes, 50 miles northeast of Cabo San Lucas. From this point southwards you will more and more encounter swells and surf effects from the vast Pacific Ocean. North from this point, the Sea of Cortez is more like a very large lake. Although May and June in the spring, and October and November in the fall, are the peak times for fishing in the East Cape area for most species, the summer fishing season finds large blue marlin and black marlin feeding on dorado just outside the reefs and inside of the 100-fathom curve. Winter has frequent north winds and the slowest fishing at East Cape, but there are usually some sierra, skipjack, and bonito around to mix with the resident snapper and sea bass types. 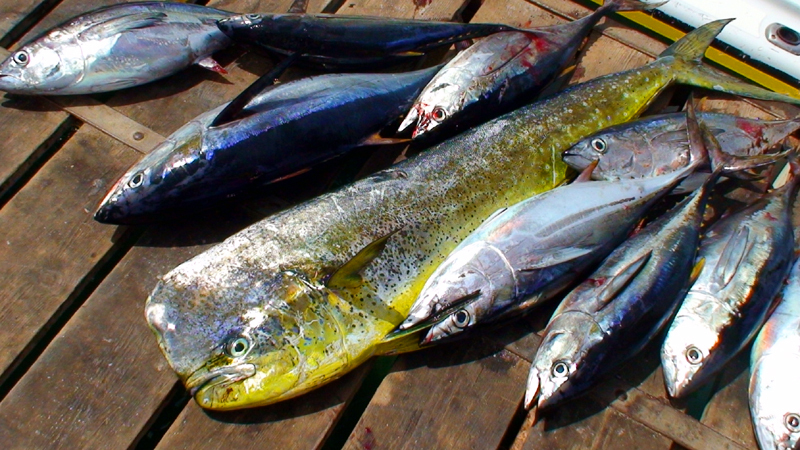 Jack crevalle, amberjack, ladyfish and barred pargo are often found here right up near shore. Sierra, ladyfish and giant needlefish can be caught from the beach north of Cabo Pulmo. Cabrilla, snapper, barred pargo, grouper and triggerfish live among the reefs there. Dorado, marlin and school tuna sweep in from the outside to feed--all within three miles of shore! This beach area also has stone patches sprinkled about that are the home of schools of roosterfish. When the roosters are chasing bait close to shore here, the best lure is a shiny chrome three-and-a-half-inch spoon cast right up onto the sand then retrieved rapidly back into the water. When roosters hit the spoon in really shallow water (we’re only talking about a few inches here) there is an explosion of spray followed by long powerful runs up and down the beach. East Cape's Punta Arena is the easternmost projection of the Baja California peninsula, and the fishing water here drops off rapidly to over 1,000 feet deep only a mile offshore. Virtually all of the game fish that migrate into the Sea of Cortez must swim past this point. Near shore right at the point are sierra, ladyfish and jack crevalle. With the historic opening of the Rancho Buena Vista sportfishing resort in the 1950s on East Cape's Bahía de Palmas, the resort sportfishing business as we know it today began on the Sea of Cortez. Soon, a resort fishing village Los Barriles sprang up four miles north of Buena Vista where the highway meets the sea. This double village of Los Barriles-Buena Vista is the heart of the fishing area that is thought of as "East Cape" by most people today. The inshore fishing inside Bahia de Palmas is actually pretty good, much better than the resort people and most visitors think. Fishing northwards toward high Punta Pescadero, the East Cape shoreline turns to gravel at the mouth of the wide arroyo one mile north of Los Barriles, and the near-shore water is a small shelf of rocks, gravel, sand and a little vegetation over which lots of yellowtail snapper, triggerfish, fileskin (or orangeside) triggerfish and pompano dwell. Some of these fish run to five pounds. A very deep underwater trench drops off at the northern edge of this shelf. This is the famous “tuna canyon” that figures in the offshore fishing here. There isn't much shoreline fishing action over this trench. North of this arroyo, the East Cape shore changes to a sheer cliff with a narrow road along its base leading to the Hotel Punta Pescadero, six miles ahead. The shoulder of the road is built on big rocks that continue out into the depths. Fishing along here is only fair, mostly for triggers and leopard grouper. At the mouth of the next arroyo, which is very wide, the East Cape shoreline again is gray gravel and stones that continues out into the water as a shelf. Here the fishing action picks up dramatically on barred pargo, snapper, cabrilla and grouper--easy to break your line, rod, or reel here. We weave back and forth across the mouth of this arroyo catching-and-releasing. It’s tough to leave this place. As you approach the Hotel Punta Pescadero, you find reefs everywhere, with big, smooth gray rocks protruding above the surface here and there. Extending out from the front of the hotel is a marvelous fishing reef that goes at least three-quarters of a mile out, and has a current slick flowing over it. This large reef is just loaded with fish of many types. Using polarizing sunglasses to look down into the water you see them everywhere swimming to-and-fro over the sand patches between the boulders. They are so fearless here that you can actually see them strike a lure on a short line! This is one of the best snorkeling and diving areas we’ve ever seen. The dominant fish species here are barred pargo, cabrilla, triggerfish, fileskin triggerfish, and a short, very fat gray sea bass type that struck and ran like a big barred pargo but always broke us off in the caves. This reef descends as it continues out a couple of miles before dropping into 3,000-foot depths. This drop off is prime marlin and tuna grounds for East Cape's many private and charter fishing boats. Fishing southwards from Los Barriles, you must avoid the labyrinth of anchored hotel cruisers and private fishing boats. When clear of them we move inshore, zigzagging along, covering all of the near-shore water from almost on the beach to 100 yards out. South of Los Barriles, and approaching Buena Vista, dark patches will appear here and there on the sandy bottom. Triggerfish and grunts are over these stone piles. Small pompano are wandering around in schools but they don’t seem to hit a lure. Nine miles south of Los Barriles, the small East Cape town of La Ribera comes into sight, a little inland, with a few pangas on the beach. Half a mile off this town is a dandy fishing reef a quarter-mile wide and one-and-a-half miles long that is only eight to 12 feet deep. It has black rocks and weeds on a sand bottom. This reef has, by far, the best inshore fishing south of Los Barriles, and you could sink the boat here with snapper, barred pargo, hogfish and big triggers--all fine fighters and the best of eating. This special East Cape reef is the only place in Baja where we have experienced a wild, continuous surface bite on schooling triggerfish, as they erupted in big boils and jumps all along in front of the town. An unusual sight, to say the least. The southern half of Bahía de Palmas and southwards to Punta Arena and Punta Colorada has a shallow sand shelf that is prime roosterfish water. In shallow water inshore fishing throughout this East Cape area, the seasonal catch would be expected to include: several true cabrillas, jack crevalle and roosterfish, pompano, assorted other jacks, leopard grouper also called "cabrilla," triggerfish, snappers, sierra, ladyfish, barred pargo, needlefish, ladyfish, and many, many, many other miscellaneous species. Because of the great depths just offshore and the abundant food, billfish will often come well inside of the 100-fathom curve in the East Cape sportfishing area. Dorado, roosterfish, sierra, bonito, skipjack and other middleweight species come well inside of the 50-fathom curve, almost to the shoreline to keep from becoming bait fish for the large marlin. Fishing of all types takes place closer to shore here than in other places. At East Cape, "inshore fishing" and "offshore fishing" get mixed together. This stretch of the Sea of Cortez sets an almost unbelievable standard of sportfishing quality for the rest of the world.